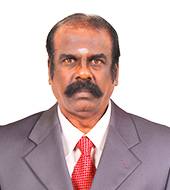 Dr.Jothikumar has previously worked as Professor of Statistics, in the Department of Statistics, Principal(i/c) Presidency College (2008-2009), Dr.Ambedkar Government Arts College, Vysarpadi, Chennai (2009-2010) and Joint Director of Collegiate Education (P &D) (2010-2011). He joined as Associate Dean in Faculty of Science and Humanities in 2011. Presently, he has published research papers on assessing the Profitability Analysis of Private and Public sector Banks in India. He is a member of Indian Bayesian Society, Banaras Hindu University, Varanasi, Indian Society for Medical Statistics, New Delhi, and Society of Statistics, Computer and Applications, New Delhi.